Photo of Mamiya C3 sent in by Ken from Australia. Photo © Ken from Australia. Many thanks for this photo contribution to the Mamiya C330 page by New York City photographer Clayton James Cubitt. A few words on the Mamiya C330 for the many connoisseurs of this twin lens reflex medium format film camera. One of the cameras I work with is the Mamiya C330f so I have used it as the basis for this article. The Mamiya C330 is a fairly heavy camera to handle. They were popular with wedding photographers. 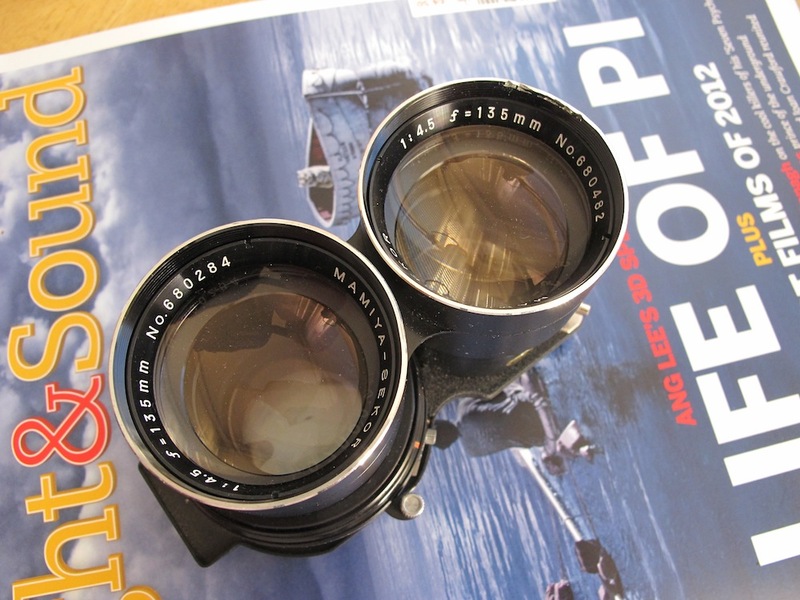 Now, they are mainly used by film and medium format enthusiasts. The mechanical shutters on the Seiko lenses of a Mamiya C330 are pretty much silent, just the short whirring during slow shutter speeds. When the film is wound on the shutter is automatically ‘cocked’ for firing. On the longer lenses you may sometimes have to do it manually. There are numerous ways to hold the camera and each person will find a way which is comfortable for them, with or without a grip. 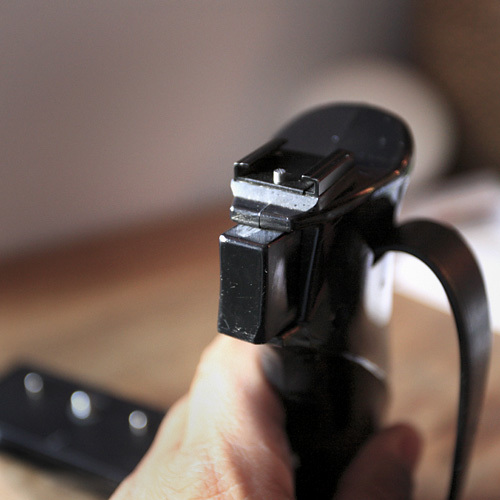 There are two ways to fire the shutter on the camera, one way to lock it, and you can also use a shutter release cable. Focusing is usually difficult without using the pop-up magnifying glass. The parallax caused by the distance between the focusing lens and the shooting lens is only apparent at closer distances, at which point the bellows are extended further and extra exposure time is required. Big enlargements can be made from the fine grained medium format films. For close-up shots there is an accessory called a paramender. This needs to be used along with a tripod. The paramender allows the photographer to make a simple adjustment which compensates for parallax and allows correct framing of the image. Shooting square images is an acquired taste! If you are used to shooting 35mm then it will transform the way you view a scene and compose an image. Portraits are a delight to shoot on a square format, landscapes are different. You find your own balance within the square frame. When shooting portraits people often ask which lens to look at! The Mamiya C330 is not ideal for fast action shots but for more thoughtful slow image making. Having said that there is a sports finder built into the hood. 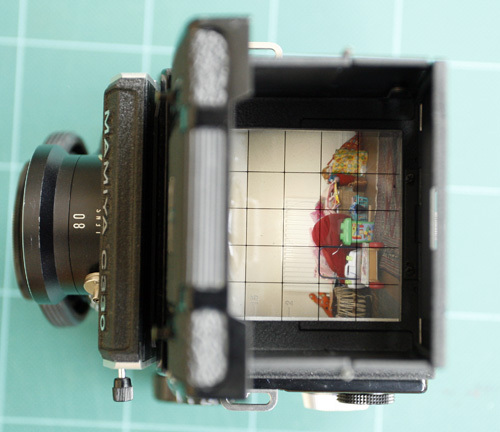 Medium format is one step nearer to large format photography. There are a range of accessories for the Mamiya C330 series of cameras some of which are featured below. 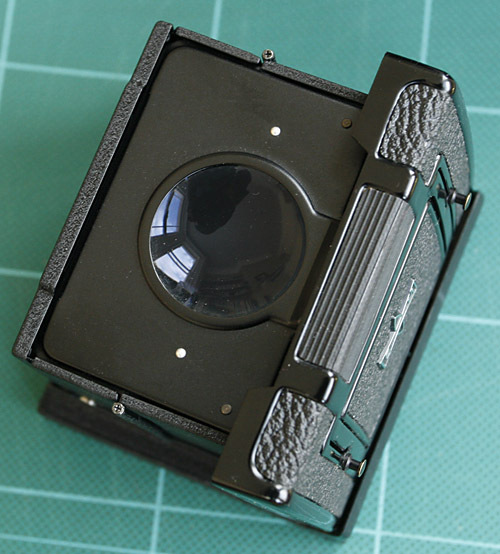 In 1940 Tsunejiro Sugawara and Seichi Mamiya founded Mamiya, the camera company. 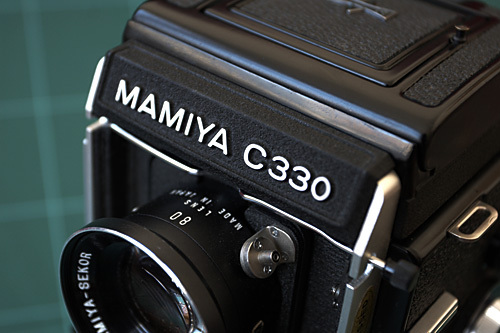 > Mamiya C330 range of cameras was introduced in 1969. The C330f was manufactured in 1972. Looking down at the view on the focusing screen you will see a back to front image brought to you by the top ‘viewing’ lens. The image you shoot will be captured by the lower ‘taking’ lens. The image is square and the film is 6cm x 6cm (2 1/4″ square). 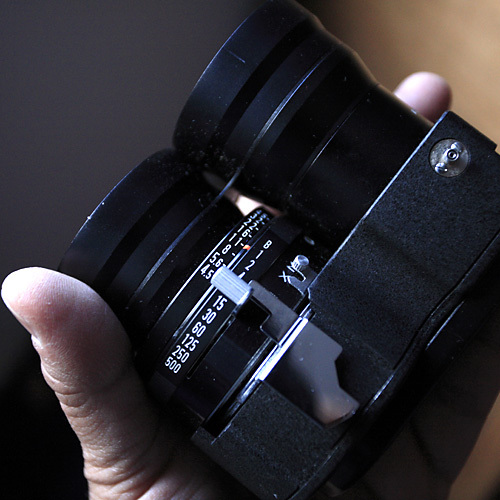 The 80mm lens is the standard lens for this format. It takes a little getting used to composing a photograph when the image is back to front. Looking down onto the viewfinder is also quite a different feel to looking ahead as with a 35mm camera. The (Checked Screen) screen marked with a grid (sits above the focusing screen) and assists in keeping the scene level when composing an image, especially for architectural photography. There are a variety of different screens. There is no tilt or shift facility. 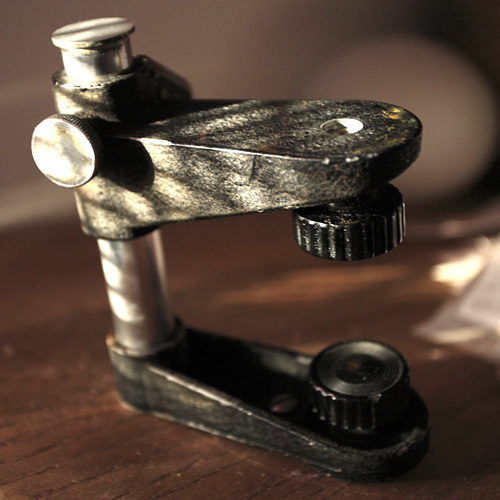 There are two wheels/knobs for focusing the camera, one of which has a tensioning lever. 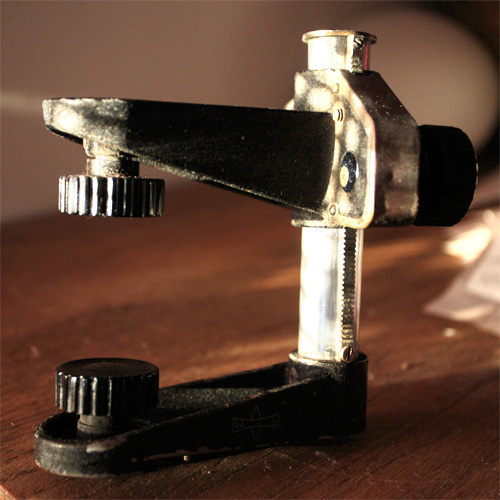 The lever tightens the focusing mechanism and is useful for fine tuning focus. Focusing is best done with the pop-up magnifying glass fitted inside the hood. 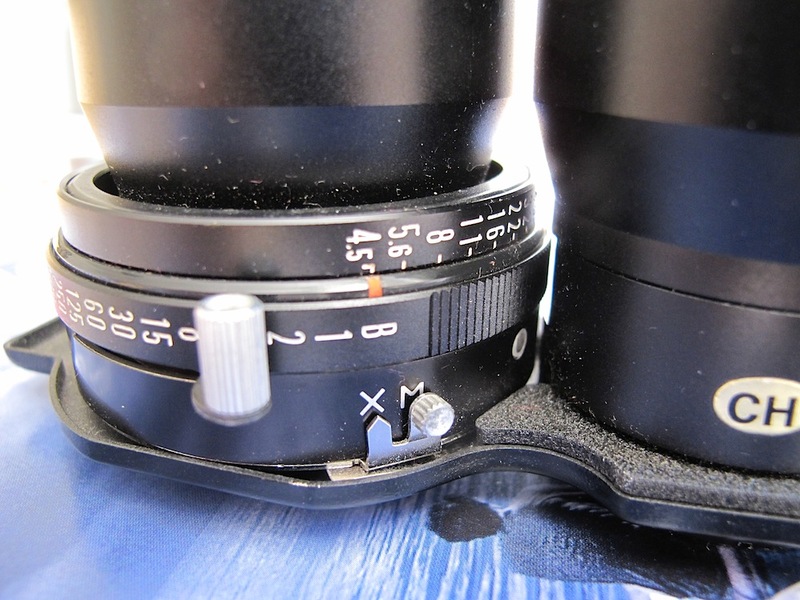 Ease of focusing varies across the range of lenses. It is more difficult with the wide angle 55mm lens. Top view without the collapsible focusing hood. Sliding out the small lever seen on the left hand side , allows the removal of the top unit. 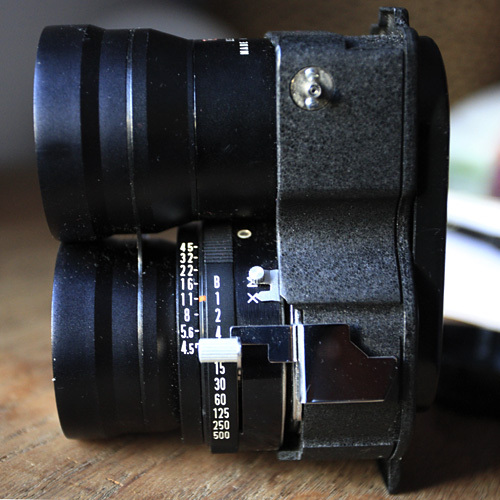 It is then possible to change the focusing screen. The digits on the screen work in tandem with a marker showing the amount of extra exposure required due to bellows extension. (The marker comes down as the bellows are extended during focusing.) 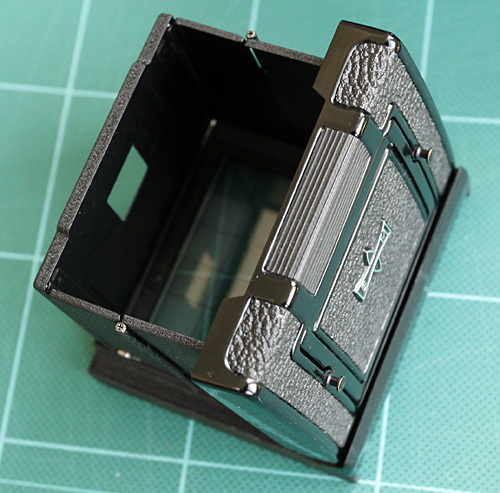 The further the bellows are extended, less light reaches the film plane. > Part of the front flips down to allow the hood to be used as a sports finder. > Bottom of the hood, showing an interchangeable screen which sits above the focusing screen. 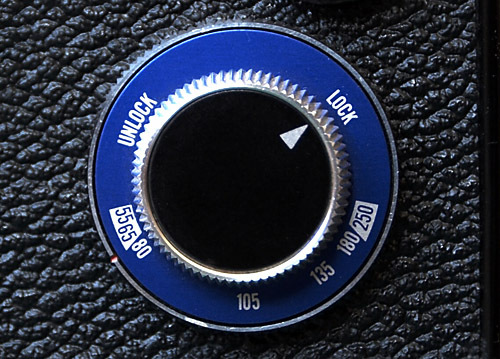 When a lens is placed on the camera the dial is turned to ‘LOCK’. 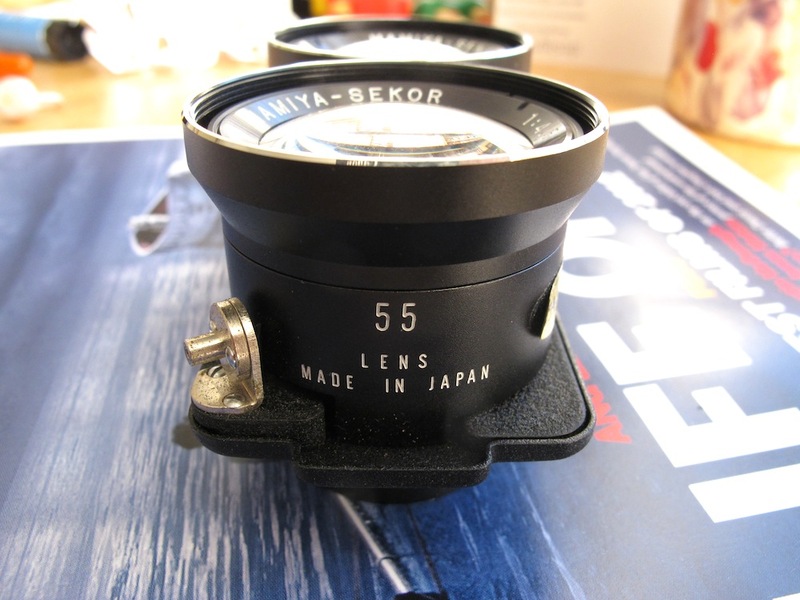 When changing a lens the dial is set to ‘UNLOCK’, a catch is released that allows the lens to be changed, and a red flag can be seen through the focusing screen which indicates the lens needs to be locked in. 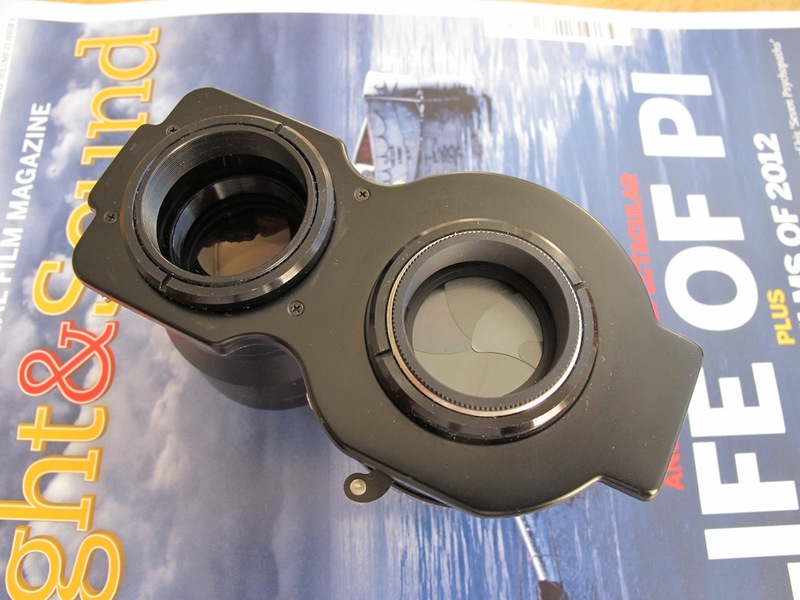 The dial on the outer edge is raised to set the focal length of the lens being used. It must be set correctly to allow the parallax and exposure factor indicators to be accurate. A pointer appear below the focusing screen which indicates the top of the frame. 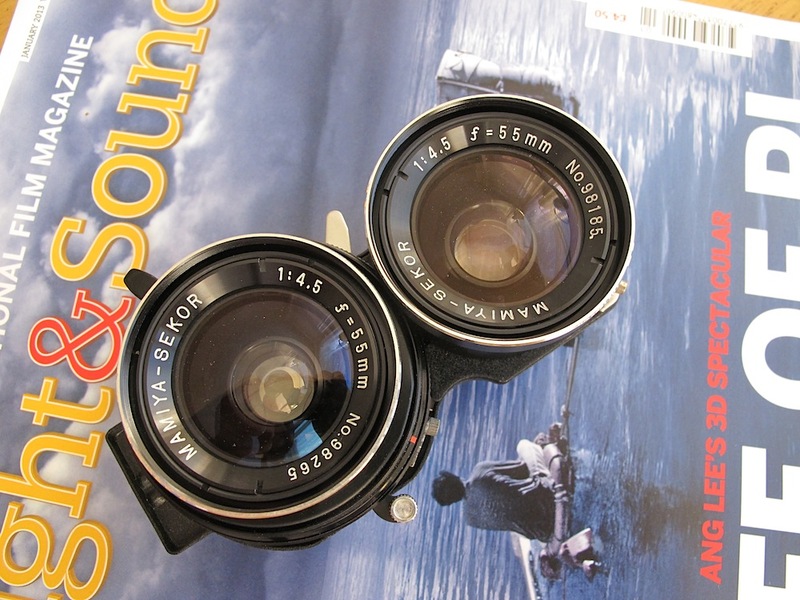 This occurs at close distances and the compensation is due to the ‘viewing’ lens being 5cm apart from the ‘taking’ lens. As the camera comes closer to the subject the indicator also shows the exposure factor due to the bellows being extended. You have to increase the exposure to allow for the fact that distance from the taking lens to the film is being increased. 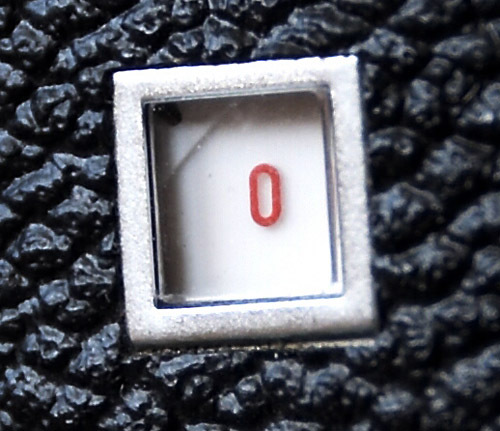 The counter sets itself to ‘0’ when the film is wound on and the camera is ready to shoot. 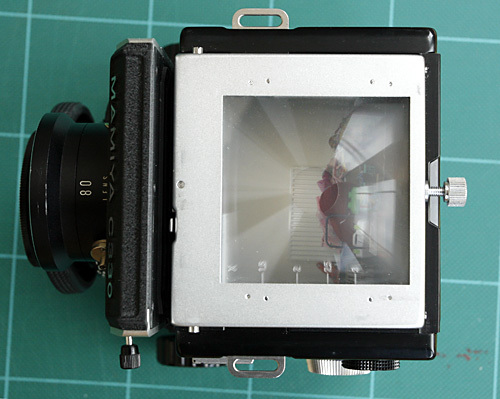 120 film gives 12 exposures on 6×6 format camera. 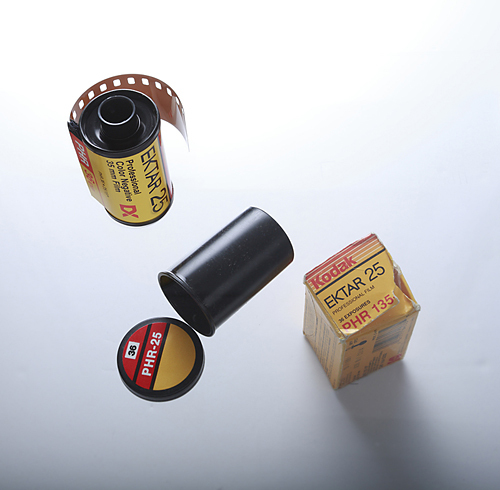 Once the 12th exposure is taken the the film is automatically wound onto the take up spool. 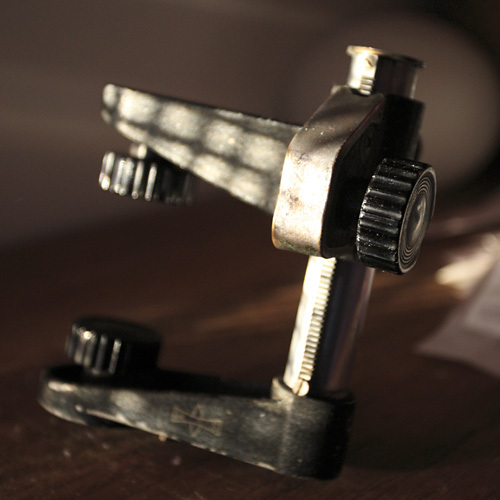 The chrome slider ‘L’ locks and unlocks the shutter release mechanism. The dial to the left is set for ‘single’ exposure, or ‘multiple’ exposures on one frame. > Indicator showing pressure plate set for 120 film. Can also be set for 220 film. 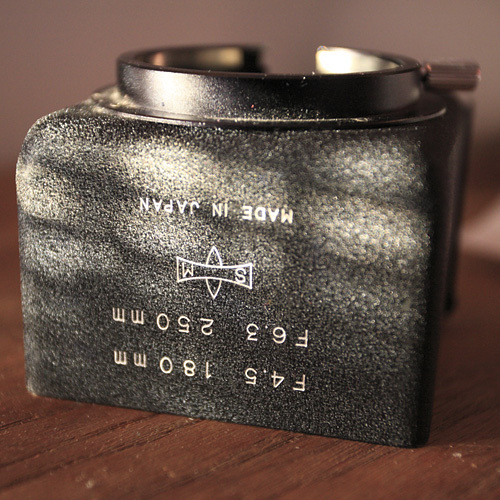 This is also acts as a holder to show what type of film is in the camera. Just tear off the end flap from the box of film and insert into the holder. 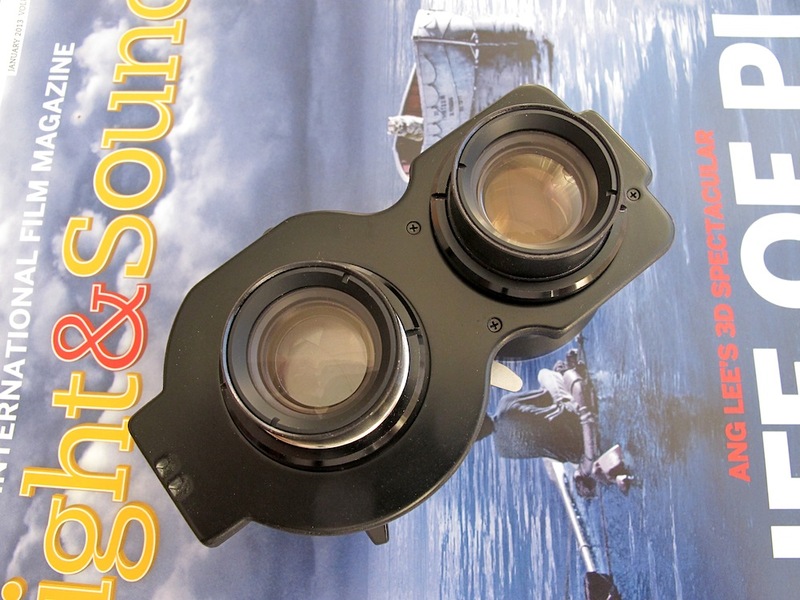 -Focusing is smooth via two round knobs on either side of the body, good for left/right handed use. There is a tensioner on the left hand side. 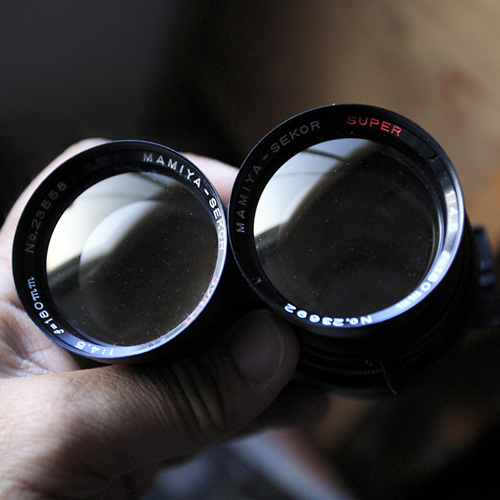 The viewfinder image varies for the different lenses. The 80mm viewing lens is quite clear. In low light the outer part of the image can be a little dark. The focusing mechanism is based on a rack and pinion system. 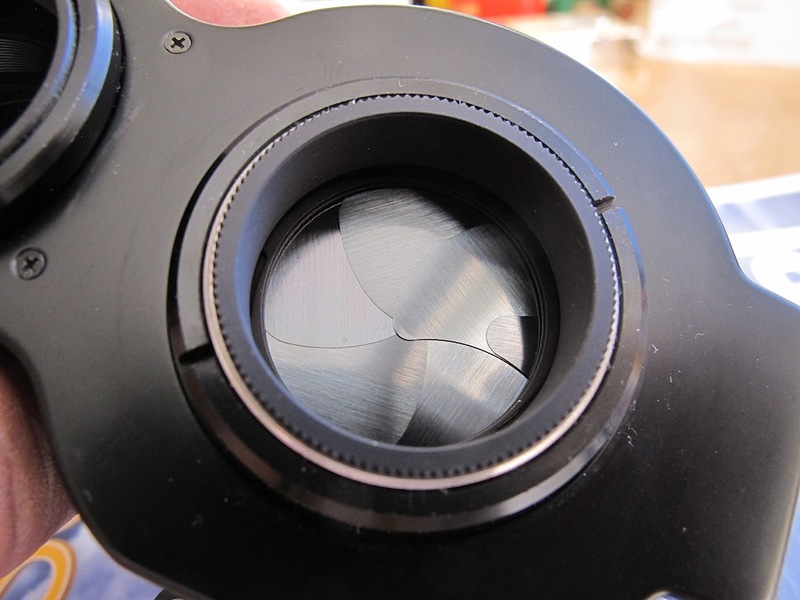 The bellows system allows the lenses to be used for close-up work. 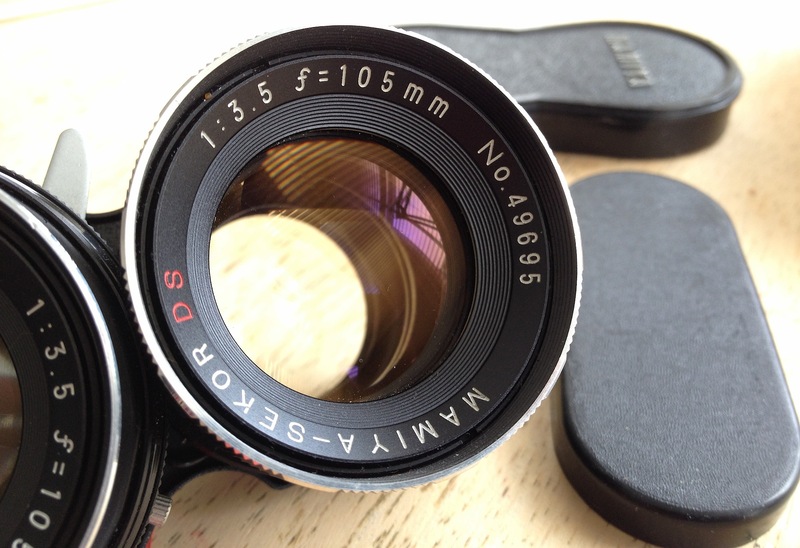 55mm f4.5 wide angle lens: not the easiest of lenses to focus! > The darker area is the balsam fault. 80mm f2.8 blue dot: Is the lens I use the most. The blue dot means it is fitted with the latest of the two Seiko shutters fitted in the all black lenses. It gives crispy sharp images and produces great results with colour transparency film. The MXV setting is quite rare. 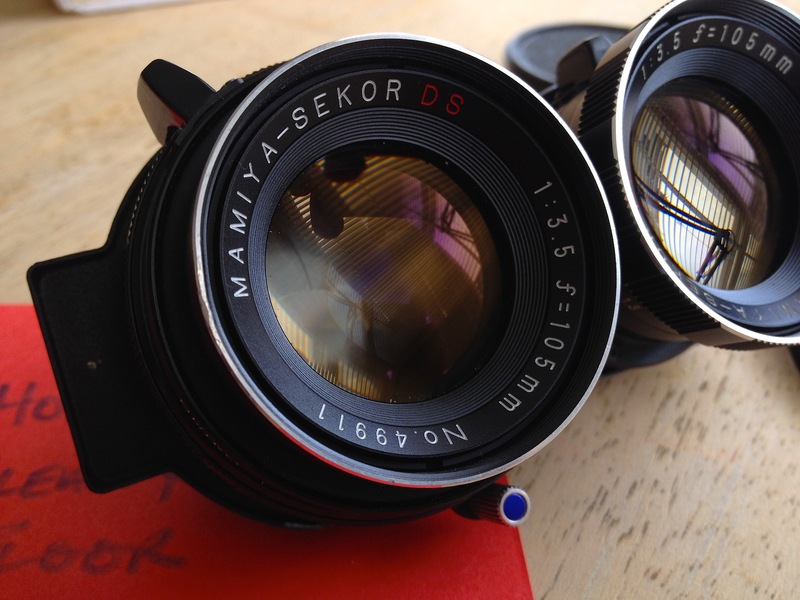 This may well be the only lens in the Mamiya range with this choice of settings. 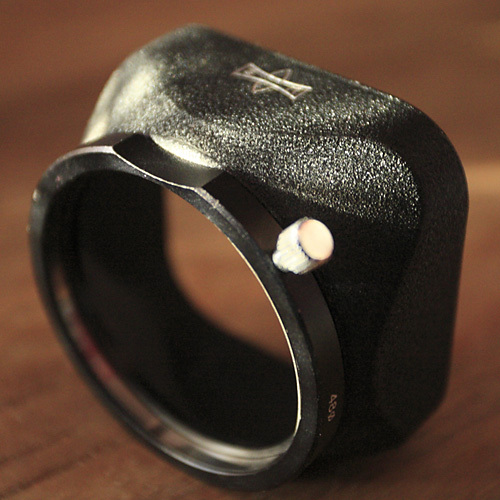 The ‘V’ allows for a timed shutter release. Yes, a chance to take selfies! The flash synch connection is at the top right of the lens. 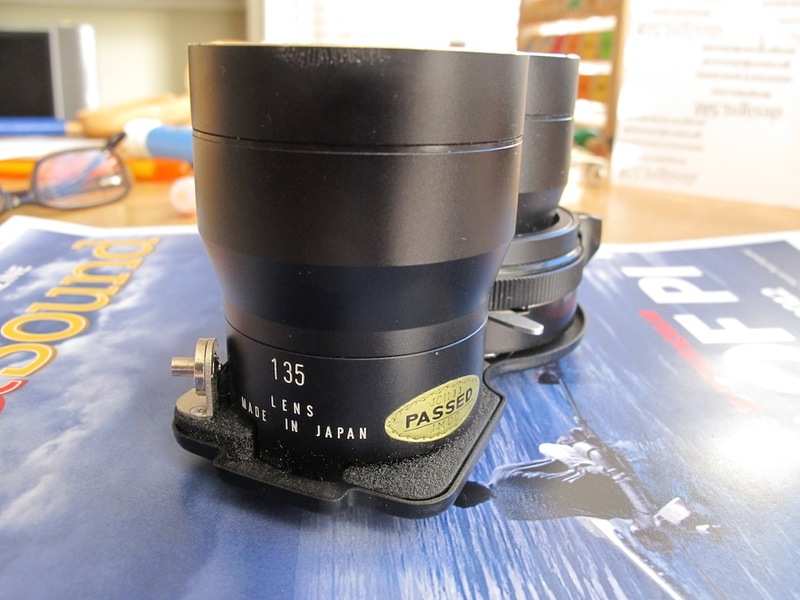 This lens also has a balsam defect. Stopping down the lens would mean it wouldn’t affect the image. Taking photos at a wide aperture may mean some softening around the edges of the image or possibly no effect at all. Can only find out by trying the lens on the camera. 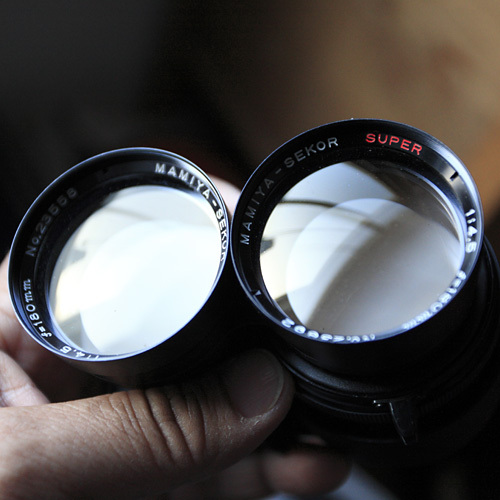 180mm f4.5 Super: doesn’t require long bellows extension as it is a ‘telephoto’ lens as opposed to being a ‘long lens’. Aperture from f4.5 to f45. Shutter speeds up to 1/500th second. 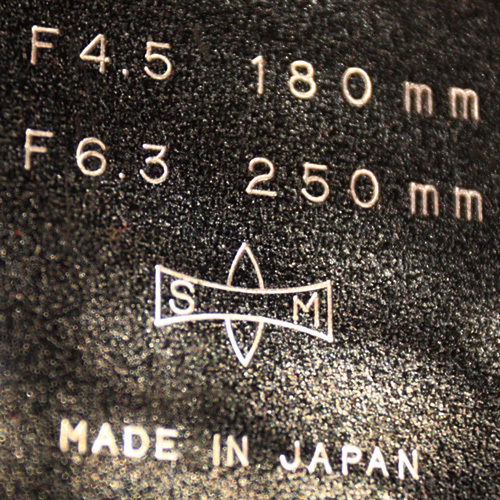 Lens hood for the f4.5 180mm and the f6.8 250mm lens: An all metal construction lens hood, Made in Japan. I have never come across a 250mm lens for the Mamiya. 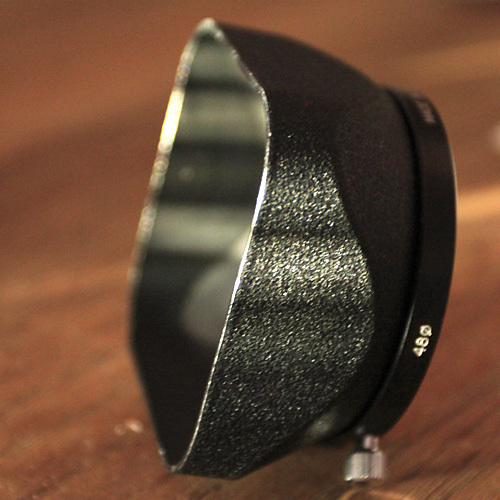 Lens hood for 80mm lens: Metal finish with a square opening much like the Leica lens hood. 48mm diameter. 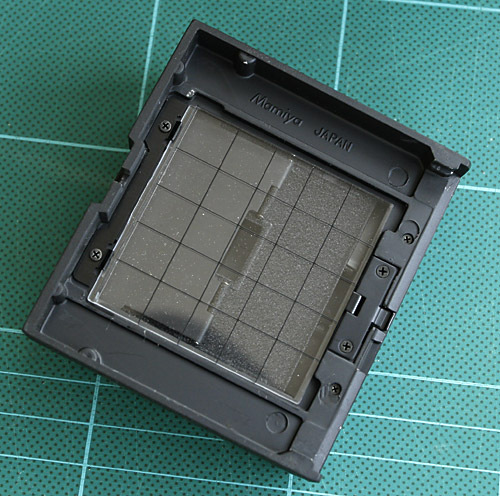 Focusing screens There are seven different types of focusing screen made of acrylic resin. They are: Type A: Matte. 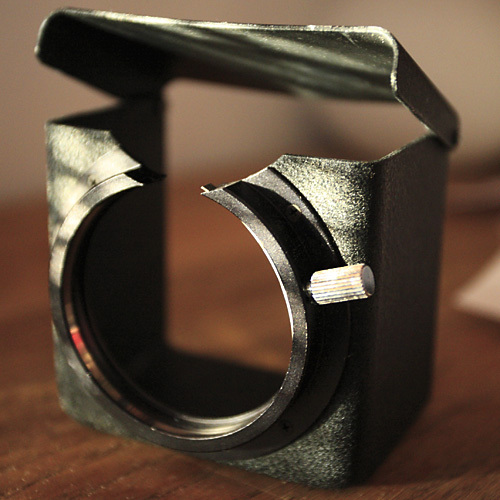 Type A2: Matte for wide angle lens. Type B: Rangefinder Spot 4º. Type B2:Rangefinder Spot 6º. Type C: Microprism. Type D: Cross Hair. 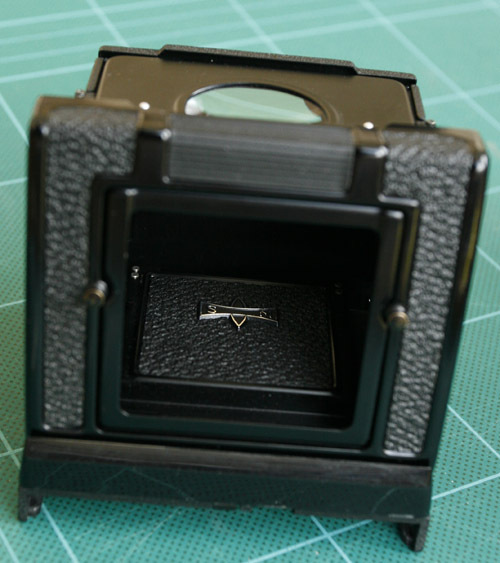 Type E: Rangefinder Spot/Microprism. Paramender Model 2: Paramenders help to overcome parrallax problems when focusing at close distances. 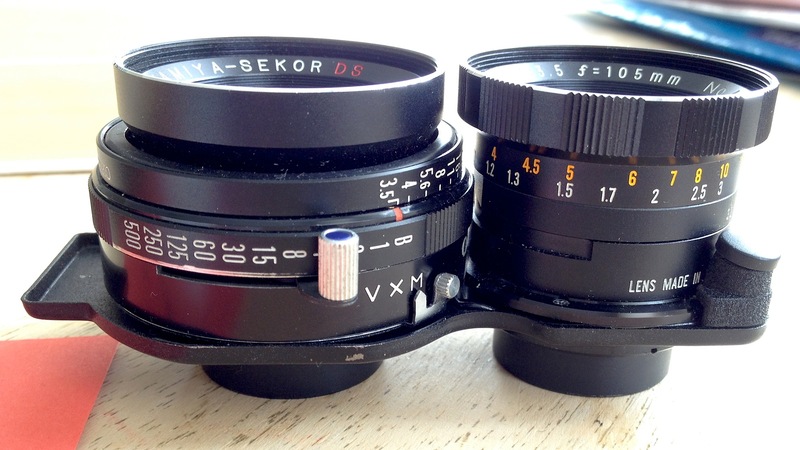 There is a 50mm difference between the viewing lens and the taking lens. The paramender helps to bridge that gap once composition is complete. The red marker in the viewing screen shows where the top of the frame lies whilst you compose the shot. 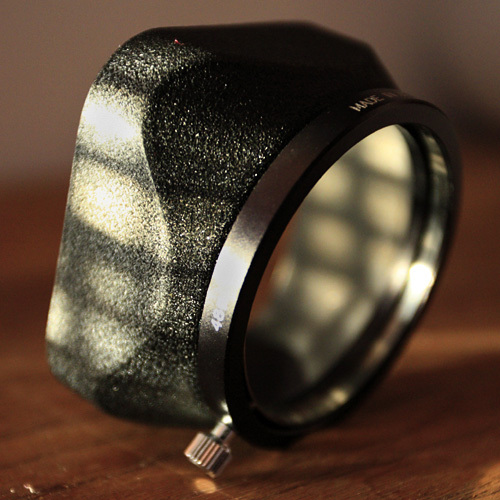 The common filter size is 49mm, and the one that’s difficult to find filters for is 46mm. 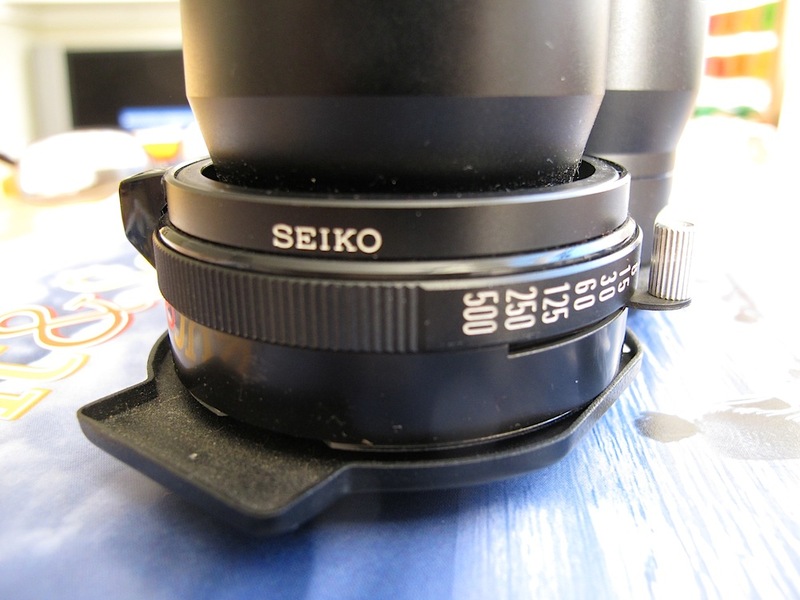 You can buy a step-up ring which converts the 46mm to 49mm. I think there are other step-up rings also. There are two flash synchronisation settings. They are X and M. It is best to leave the marker pointing to X, which is for synching to electronic flash. The flash will synch at any shutter speed. The flash cord fits into the socket on each lens. The flashgun can be attached to the left side of the camera body or to the top of the pistol grip. Might be a bit heavy depending on the size of your flashgun. Loading film: is best done in subdued light. Make sure the film is firm and flat. With a bit of practice it is easy enough to feed the film into the take up spool. Light pressure on the take up spool as you wind it on until the ‘START’ markers appear, which line up with the two red dots on the camera body. The backing paper faces you as you feed the film on to the take up spool! I have used transparency film Fuji Provia 100F and Fuji Velvia. There is very little margin for error when using slide film. Colour negative film has more exposure latitude and is good for scanning. Porofinder: There is a Mamiya branded reflex finder, there are also cheaper copies which tend to give a darker image, hence very difficult to focus in low light. Light meter: Unless you are using a metered hood, a handheld meter is required for taking exposure readings. For portraiture and near distance incident readings work well. For longer distances a spot meter is needed. A meter on a 35mm camera can be used. (I use a Sekonic and Minlota meter…) Use the same meter all the time. Get used to the reading that it gives. I prefer incident light reading whenever I can work with them. Bracketing with transparency film is usual. With time, you can get the metering right first time! The cable release screws into the chrome shutter release button which protrudes at the bottom of the body. Grip holder: There are at least 4 models including a multi-angle grip. 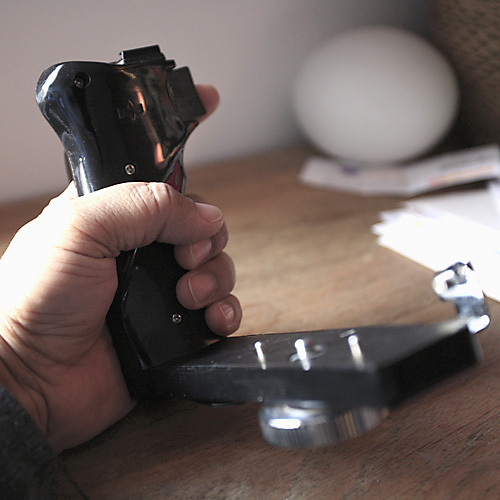 I use one which enables me to release the shutter via the grip. 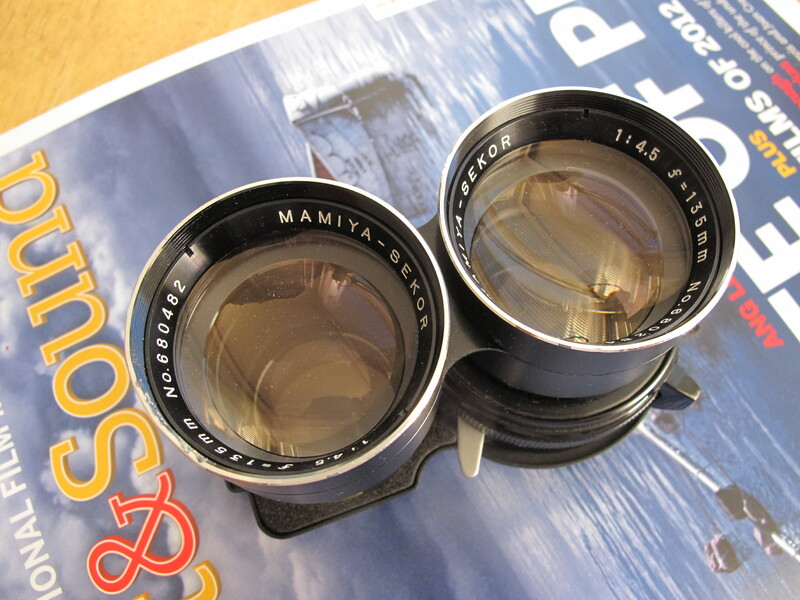 (It can also be used with the Mamiya RB). The camera feels more stable with the grip. Tripod: Needs a decent quality tripod. Does need a rock steady tripod for close-up macro shots. The Mamiya leather case is a rarity. This one is black with a nice texture. All the spaces exist for accessing the controls on a C330f. Not sure if this one fits all models. When the front part of the case is removed the tripod mount can be used with the case still on the body. There is also a soft leather case (pouch), a compartment case and a Mamiya aluminium custom case. 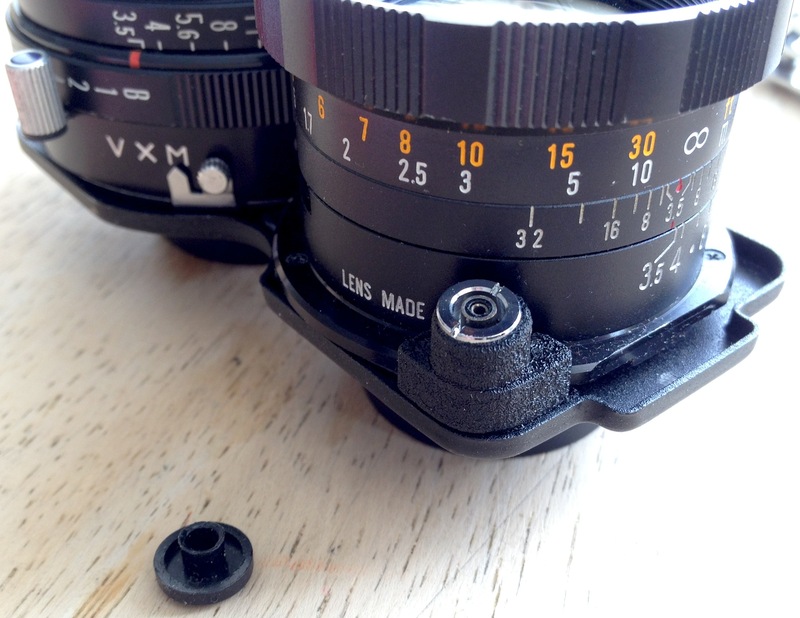 They should be cleaned, and is relatively easily replaced at most independent camera shops. I have removed the seal with lighter fluid, (perhaps nail polish remover will do it) can take quite a while to clear. You can buy one sided sticky rubbery/spongy material (don’t know what it’s called) which does the job. If you leave the seal decaying then it will spread around the inside of the camera as it’s quite sticky. Portrait of Sussex artist Dion Lloyd Salvador shot on Mamiya C330f on black and white film. Scanning images: I shoot mainly colour transparency or black and white films. I use a Nikon Super Coolscan 8000ED which scans 35mm and 120 film. It’s a very good quality scanner. Drum scanning or professional photo lab scans may be a better option. It depends on your requirements and budget and final usage. Portrait of Lee Harwood – Poet shot on Mamiya with 135mm lens. The image on the left is the one featuring on this blog… perhaps it is too sharp! The image on the right is going to be published and I have prepared it as a softer image more in keeping with what I wanted from the image from a film perspective. There is a great emphasis on sharpness in the digital debate that other lens ‘qualities’ are forgotten. I often produce several variations from one image whether in the darkroom or with Photoshop. The original portrait was shot on the Mamiya with my 80mm lens (probably f8 or f11), and scanned on a Nikon 8000 Super Coolscan. The following two details were taken from a 26Mb tiff which would print at 10 x 10 inches at 300dpi. They were cropped out of the image as 500 x 500 pixel square portions and then downsized to 72 dpi to display here. A small amount of sharpening was added. 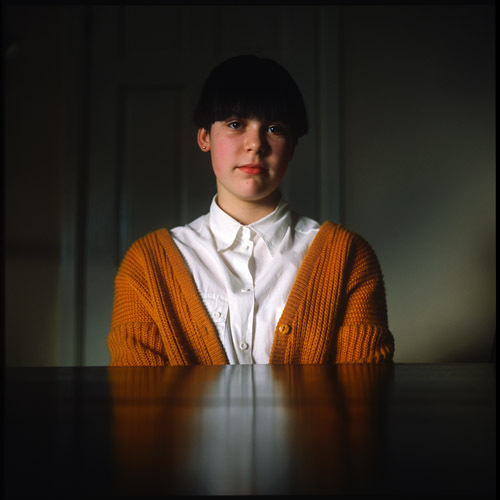 > A photograph shot on the 80mm lens, Provia 100F transparency film. All text and photographs 2008-2017 ©Bip Mistry unless otherwise credited. 2-3 surface on e-bay over the past 4 years, and never again in person. fine arts is pretty incredible. Thanks for sharing. latest and greatest in digital cameras. May the world of photography bless you for years to come with your C330. > Film is not dead! There is no dedicated digital back for the Mamiya C330 camera. Digital backs fit on selected Mamiya RZ bodies usually with an adapter plate. Use the C330 as a film camera. I shoot transparency and black and white film and the results are great. Aaah, such a fine machine and what a fine post with very some good and useful contents too. Great post! Thank you for the recopilation. i just got this camera for christmas… can’t for the life of me find out where to set the asa… can you help? Hi I have same problem, did you get an answer? Howdy – there is no need to set an ASA / ISO speed on this camera, as there is no metering system. Some of the prism finders have meters built in; I imagine they would have a control for setting film speed. Just set the appropriate f-stop/shutter speed combination and shoot! Thanks for the wonderful post – info and pics. Martin, there is no ASA setting on the camera. You need to set the film speed on your hand-held meter. 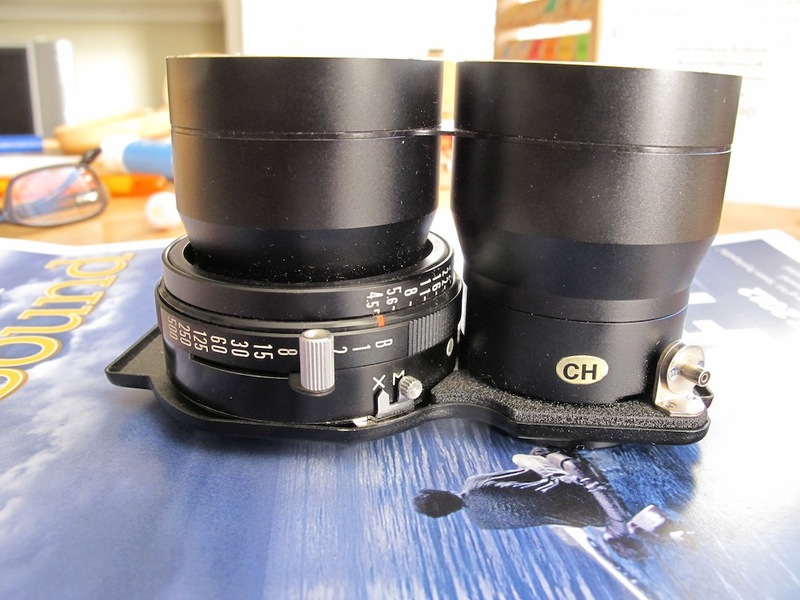 I own the C330f, 55/65/80/135/180Super lenses – all black, late serial numbers. A very kind photographer friend of mine loaned me his C330 when he saw that I was taking my new hobby quite seriously. After some time, he made me an offer to keep it that I couldn’t refuse. It has since replaced my modern Canon DSLR as my preferred camera when I’m going out to take photos. For someone who started in the digital realm, there is a bit of a learning curve as I believe digital cameras tend to encourage intellectual laziness and poor shooting habits. Working with a fully manual film camera like the C330 will make you a better photographer! I’m so pleased to have one. This is a classic! I wanted to try one out before buying. There is a great store near walmart, i forgot the name. they let you test out the cam. I’m not sure if anyone can help? 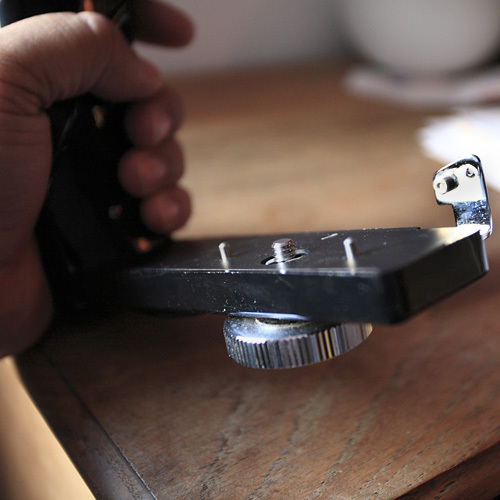 When I draw in the billows on my C330 the shutter release button will not go down. 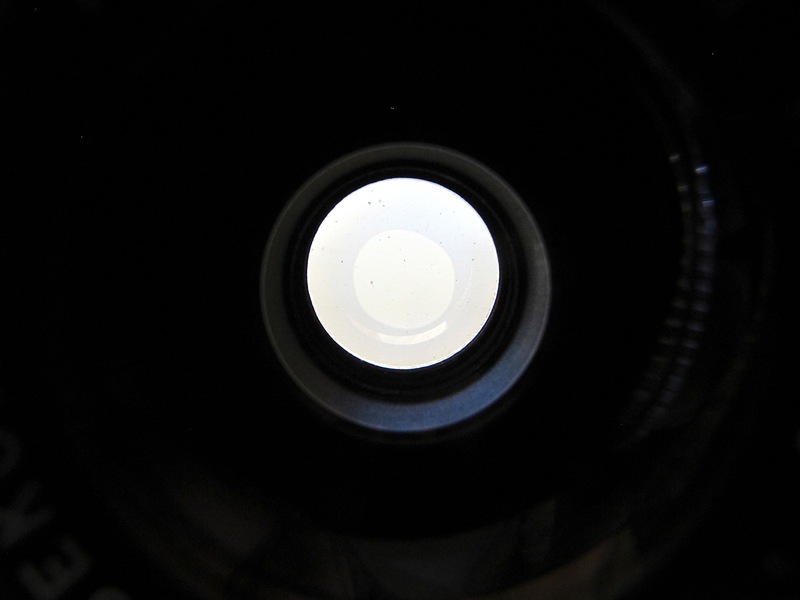 But as I start to draw out if will go down at about the halfway point, I’ve got the 80m lens fitted. If anyone has any idea why this is then that would be great. 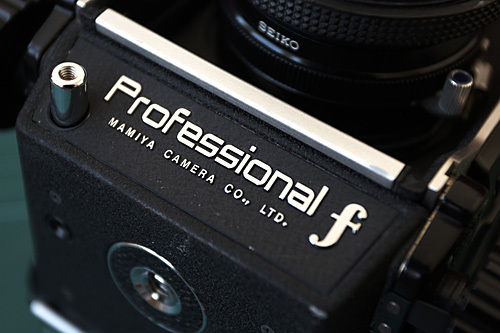 Im dying to get the Mamiya. How much is it and where can i get one? Do you have any photographs to share? Website? single shot replacement back of the 330C for taking single shot photos? You can get a nice C330 at a fair price from keh.com and still be reasonably sure of good quality. Make sure to get BGN quality or better! Thanks Magnus! Im on it! Try and get a good quality one and a recent model with an all black lens. They are ageing cameras. 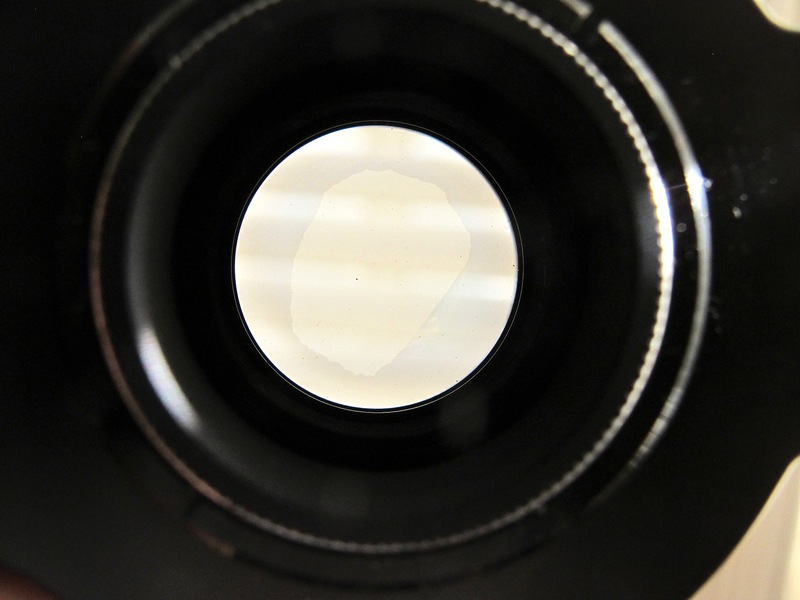 Make sure the lens is clear of clouding or balsam defect. Good luck. I have a few c330 professionals with various lenses and accessories for sale. They were my dad’s and he just passed away. Anyone wanting info please email me. He was a professional photographer. Email at exhaleandinhale@yahoo.com Thanks! Great review. I have recently purchased a C330 with a 80 and 135 mm lens. I hope to make great pictures with it. what is the most recommendable film for this beauty. I just get a mamiya C330, thanks for everything. Pablo, you’re in luck as there is quite a selection of both modern and classic films on the market right now. In B&W, I’ve particularly enjoyed Fomapan’s offerings (which are available very cheaply from Freestyle rebranded as Arista.EDU) as well as Kodak Tri-X. For color, I like Kodak’s Ektar or Kodak’s new Portra160 and 400 (if you see “VC” or “NC” on the box, that’s the old formula). And if you are a pixel peeper, you might enjoy the super fine grain characteristics of Kodak TMAX 100, Fuji Neopan 100, or Ilford Delta 100. Kodak Ektar 100 is a fine colour film for the C330 though sometimes a bit tricky on colour balance; use the slow black & white films like ADOX CHS 25 for spectacular detail and great tonality. I;m dying for use my MAMIYA. Let me know when you’ve shot some film. Bip. I love my Mamiya C330f,before i own all the best medium format cameras like Contax 645,Mamiya 7II,Hasselblad etc etc,i was thinking that is too much money in this day for film cameras,so i sold all this expensive cameras and i get my Mamiya C330F with the 135mm lens for $200 and also a 55mm and 80mm lenses for $200 dollar each one and i am so happy went i see the result. I recently acquired a C330f. I am using a free Light Meter app on ipod touch (with a camera of course) for portrait shots. You could use an iphone or ipad as well. This gives good settings for reflective light. 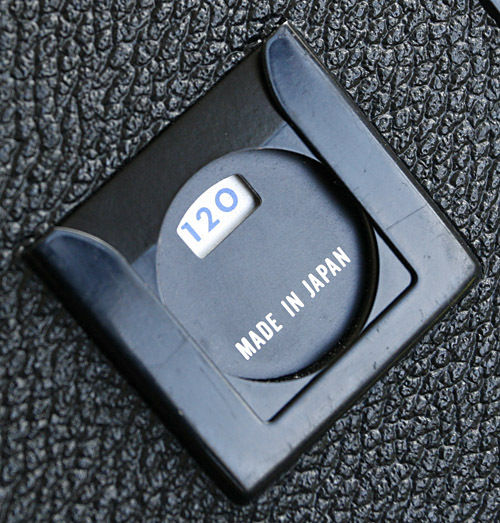 Otherwise, get the Sekonic L-208 light meter which does reflective and incident light. 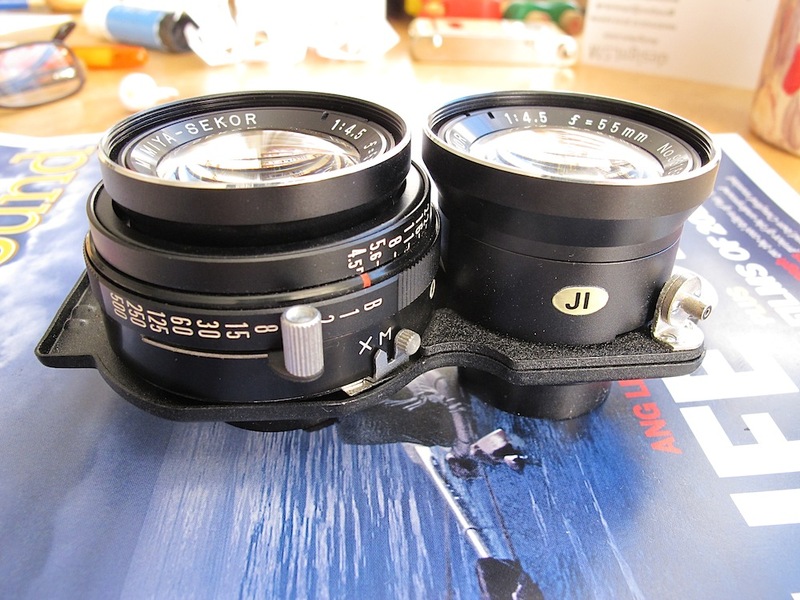 Pingback: Bought a TLR- What are these inserts? Very interesting info. Thanks! Long live film photography! Greetings from Basel in Switzerland. I love my C330, excellent, reliable and flexible enough, and not so expensive as others. There is a checkered focusing screen too. Thanks for posting! Yours is a great and through introduction to this system. I have C330 I bought sight unseen from a deceased estate on line. When it arrived it was like brand new perfect condition in the case, doesn’t have a mark on it or the case or even the strap. Beautiful to see a an object frozen in time. Just got lucky. I bought my C330f in 1981 and will NEVER sell it. 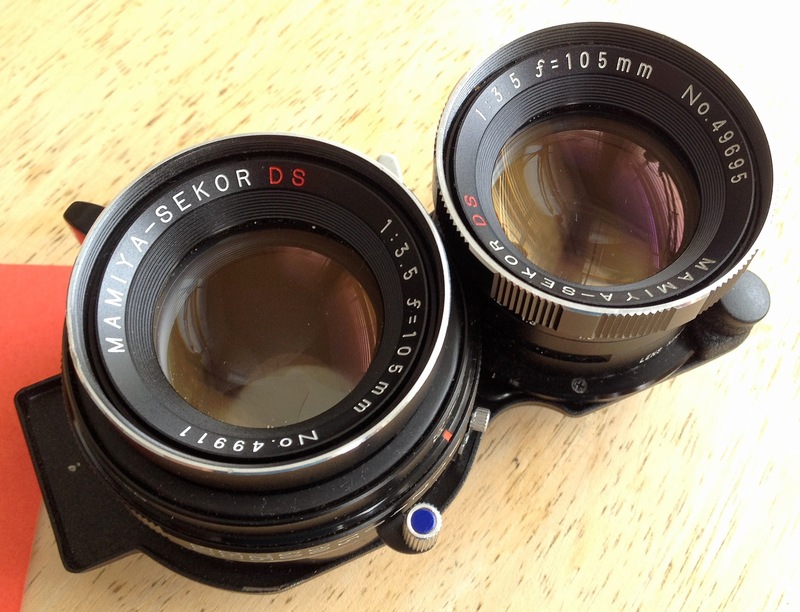 I have other much more expensive film and digital cameras but the Mamiya twins lens cameras are classics. The image quality and ease of use are amazing. They’re also incredibly sturdy and will survive being carried in a rucksack for weeks on end without letting you down. They have no batteries to re-charge !! Don’t let the equipment geeks persuade you to buy the latest DSLR or digital rangefinder camera. With a good eye, a lightmeter that you know how to use and a supply of high quality, in-date film, the Mamiya C330 is all the camera most photographers will ever need…. Get hold of one, run some film through it and be prepared to be amazed !!! Thanks for your comment Bill. I’m going to add more content in the coming weeks. I’m not sure if you get a notification when I add new content. So lucky of you Ken. I bought my C330 from ebay in almost new condition for $450. Great article with outstanding images of this super camera. Of course, I have one, had 2 when I did weddings back then. I do have the 6.3/250mm also. In fact, I have all lenses. Wonderful pieces of glass.